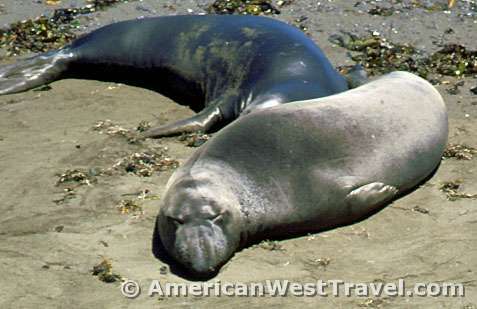 The northern elephant seal is the largest of all pinnipeds. Mature alpha bulls can reach 5,000 pounds in weight and 16 feet in length. 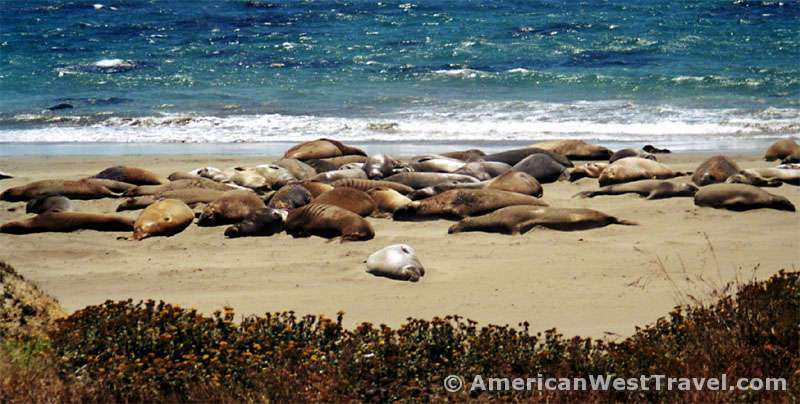 Like many marine mammals, it was hunted to near extinction in the 19th century. Until recently, the huge seals lived in isolated areas far away from humans. Then, amazingly, in 1990, they started colonizing the unspoiled beaches and coves just south of Point Piedras Blancas on the California coast. Their chosen location is just off of the Pacific Coast Highway (California Highway 1), three miles north of the famous Hearst Castle at San Simeon. 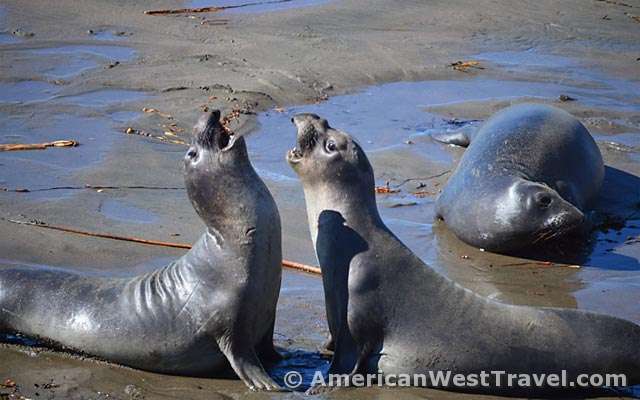 Tourists may simply pull off the road into a signed parking lot, take a short walk, and observe hundreds and sometimes thousands of elephant seals. It is a sight one would normally associate with some exotic locale in a National Geographic. The photo, below left, is taken from an main beach adjacent to the main (south) parking lot. Note in the closeup, below right, the huge snout which is the trademark of the male elephant seal. 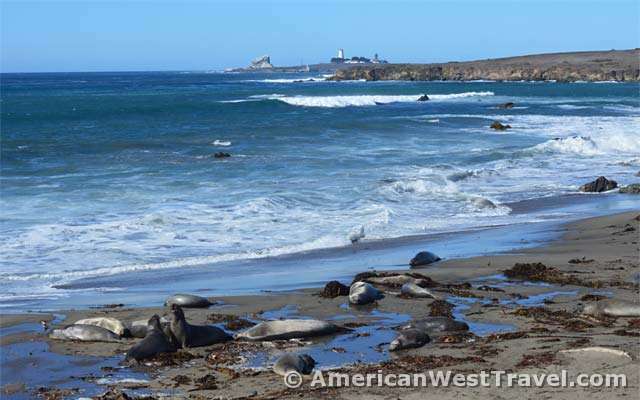 This elephant seal rookery is estimated to have about 23,000 seals though they are never all on the beach at the same time. The busiest and most exciting time is during the winter when the mature females arrive, to birth and nurse pups, and then breed for the new season. Meanwhile, the largest dominant alpha bulls will square off with each other to fight for harems. 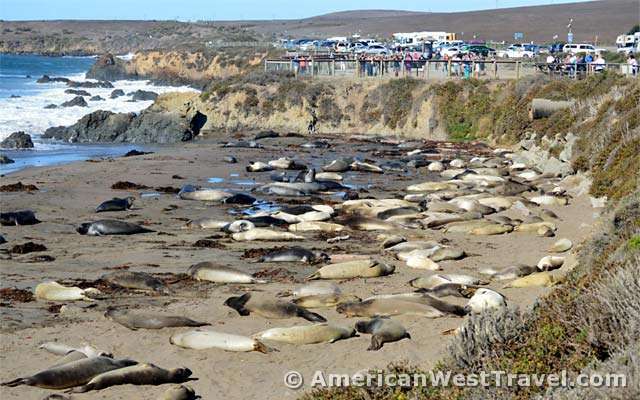 Between the thousands of pups, females, and bulls, the main beach is a chaotic scene of activity. 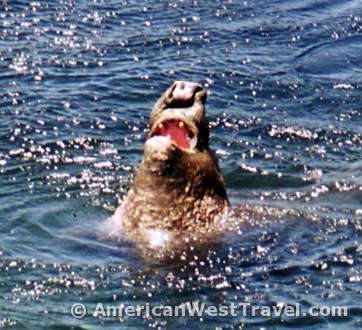 The seals are also very vocal, making loud grunting noises which sound like nonstop human belching. During the autumn, juvenile elephant seals haul themselves ashore for the purpose of resting after their long migration activities. This is a more sedate time though many of the older juvenile males engage in mock fighting, practicing for their future mating activities. Summer is the low ebb of seal activity here. Small numbers of males are present while all of the females are up near Alaska or the Northwest Pacific. This is unfortunate, as most people visit the seashore during the summer. From the smaller north parking lot, an unpaved trail heads north along the lovely low bluffs heading towards the historic Point Piedras Blancas lighthouse. The walking is easy and very pleasant. The grass and herbal plants such as mustard and fennel provide a delightful aroma mixed with the smell of the sea. Here lonely coves and pocket beaches grace the coast, mostly occupied by smaller numbers of seals. There is also a boardwalk trail connecting the two parking lots. It hugs right along the edge of the bluffs giving excellent views of the numerous coves and pocket beaches. Piedras Blancas Lighthouse tours are offered three days a week. There is a designated meetup location (at the old motel, 1.5 miles north of the lighthouse) so you cannot hike the trail to the lighthouse and then join a tour. It is not clear why these reclusive creatures would suddenly take residence in a place where hordes of people can readily approach them. Possibly it is the unspoiled nature of this section of coast. The shore has been declared a wildlife refuge from south of San Francisco to Cambria. Human usage of the shore and offshore areas is strictly limited. 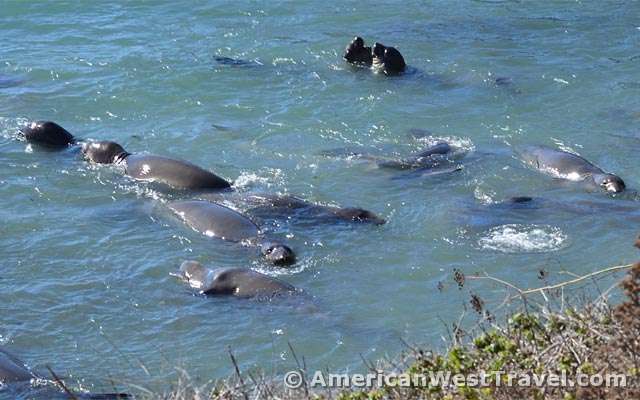 Indeed, it is a criminal act to harrass marine mammals here. Perhaps they come because people are now enlightened enough to enjoy watching them and otherwise leave them alone. Volunteers from a group known as the Friends of the Elephant Seals are present most of the time to answer visitors’ questions. Their other role is to keep an eye on the seals and make sure no humans bother them. They also sell souvenirs here to help fund their programs. At a time when our society faces hard issues such as the rapid pace of development and pollution, a wildlife success story is extremely heartening. If you come here, please just observe the seals from a safe distance, and do not disturb them in any way! 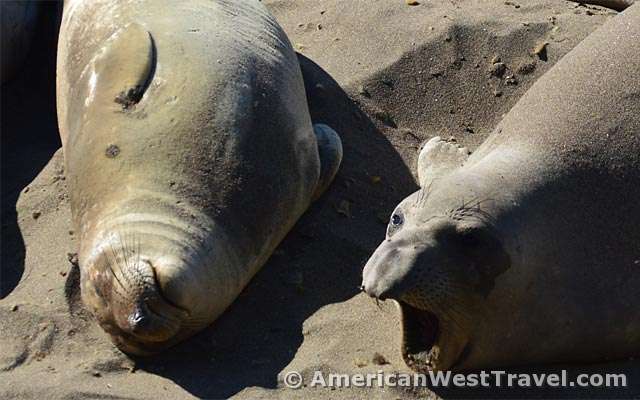 For those wishing an even more exotic experience, try visiting Año Nuevo State Park further up the coast near Pescadero, where there is a similar elephant seal rookery. (The park is about 20 miles north of Santa Cruz on Hwy 1.) The park is a designated Natural Preserve, with a 3 to 4 mile hike from the parking lot to the seal beach. 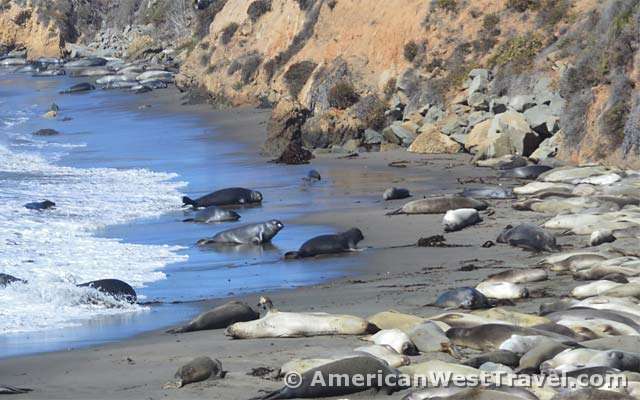 Access to the beach during breeding season is limited to guided tours available by reservation only. 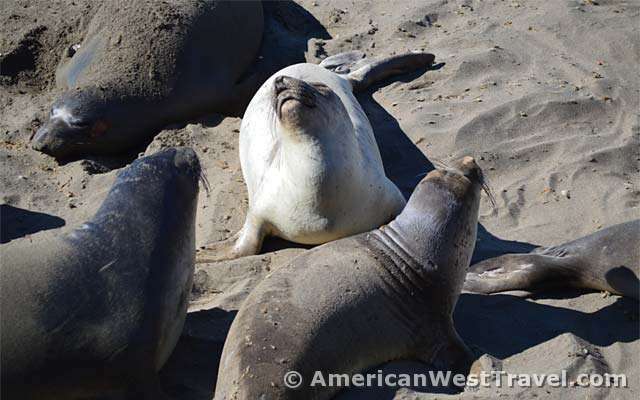 The tour is very intimate and brings you very close to the seals on the beach. We took this tour in the winter of 2003, and it was a fantastic experience. Elephant seals are unpredictable and faster than they appear to be. Even on land, they are extremely mobile for short distances. The head, which is drawn back to the shoulders at rest, can be extended two or three feet for a quick bite, and their large canine teeth can inflict serious wounds. Battles for dominance between bulls are among the bloodiest of any species. Bulls can crush a person with their two- to three-ton weight. 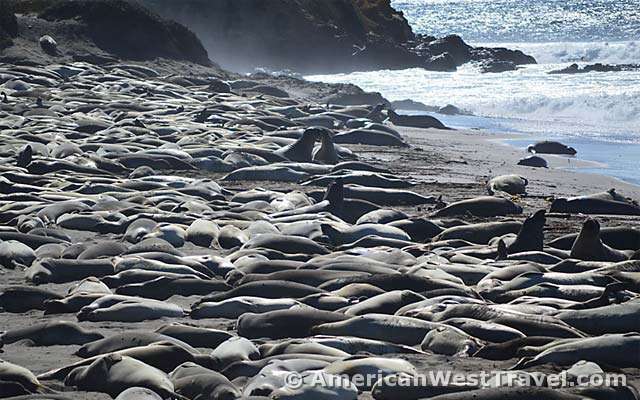 STAY at least 25 FEET AWAY FROM ALL SEALS.